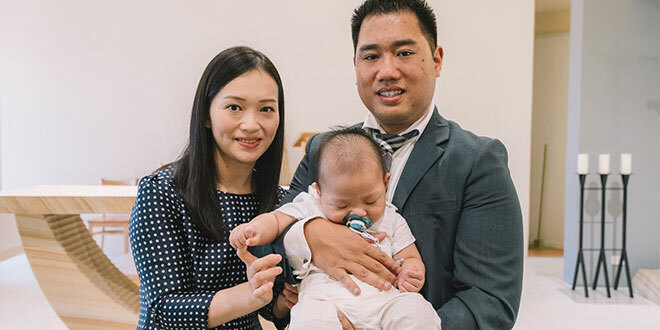 Blessed baby: Jazz Yue Yi Li and Joseph Hoang with their son Mark at his baptism. Ms Yi Li is now becoming a Catholic. Photo: Nivekeel Photography. GOLD Coast mother Jazz Yue Yi Li never thought God was real until she saw her newborn son nearly die in hospital. Ms Yi Li gave birth to her son Mark Yi Hoang on April 6 last year but after being discharged was rushed to the hospital “with a life-threatening situation”. Mark had contracted the dangerous Group B Streptococcal infection, or GBS, which can occur during labour. The bacterial infection caused baby Mark to contract meningitis and septicaemia, and he was having seizures. “I was outside the operating room, and saw him stop breathing three times,” Ms Yi Li said. At the time the Gold Coast resident said she had no belief in God or religion. “For me before I was never a believer, I didn’t believe in any religion, I just thought we can do things our way,” she said. But Ms Yi Li’s partner Joseph Hoang, a member of the Southport Catholic parish, said all the couple could do was pray that their son would not die. “Joseph was there and said to believe in God, that God can create a miracle,” Ms Yi Li said. “He said, ‘God will not let us bury him’. Ms Yi Li took her husband’s advice and began to pray. “The next morning, he was alive,” she said. Because of the brain damage caused by the bacterial infection, doctors believed baby Mark could possibly end up blind or deaf and was at high risk of cerebral palsy. Ms Yi Li said Mark was unable to move for several months. “Even at that time, I wasn’t thinking of going to church, but Joseph said I must always think of miracles,” Ms Yi Li said. She didn’t believe a miracle could happen for her son but was encouraged by her partner’s faith to hope for one. Mr Hoang’s hope also led her to start with Southport parish’s Rite of Christian Initiation of Adults group, which is available to people who want to know how to become Catholic. “I thought maybe there is a chance and someone out there can help him if we can’t do anything about it,” Ms Yi Li said. She said parish priest Fr Jan Bialasiewicz encouraged her to pray for her son’s recovery and gently walked her through the process of becoming a Catholic. Soon after Ms Yi Li started the RCIA process, her son Mark was baptised. That’s when his progress really began. By the time he reached eight months he was beginning to sit and hold his head up on his own. “Now at ten-and-a-half months, he crawls and can stand up,” Ms Yi Li said. Despite making headways with his movement, Mark is diagnosed with cerebral visual impairment, caused by brain damage. His parents are required to stimulate his vision daily and are already seeing big improvements. “This time last month he couldn’t see us, and now he can see us and smile at us even if we don’t make any sound,” Ms Yi Li said. “That made me believe even more. “First I thought he would die, second that he would be in a wheelchair forever. Ms Yi Li said her partner’s faith and the positive attitude of his parents, who are also Catholics, inspired her to enter the Church at Easter. And she’s also doing it for her son. “I can see him and his family are always smiling and happy even though we went through everything at the hospital,” she said. Ms Yi Li made her second step towards becoming a Catholic at the Rite of Election at St Stephen’s Cathedral on February 18 with Archbishop Mark Coleridge presiding. Following the rite, Ms Yi Li said her son was outside with her partner and received an unexpected blessing from Archbishop Coleridge. “I said, ‘Lucky you, even I didn’t get that (blessing)’,” Ms Yi Li said. On March 31, Ms Yi Li will be baptised and confirmed, and receive the Sacrament of the Eucharist at the Southport Catholic parish’s Easter Vigil Mass, the same day as her son’s first birthday party. “When you look for God, God is there,” she said. 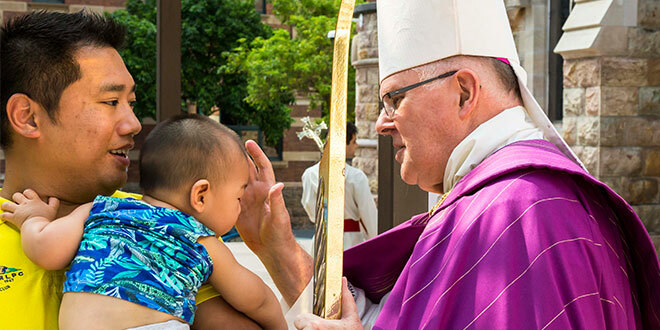 Archbishop Mark Coleridge blesses baby Mark Hoang, who nearly died after his birth last year. Mark was with his father, Joseph Hoang, during the Rite of Election at St Stephen’s Cathedral on February 18. Photo: Alan Edgecomb. Full coverage on the Rite of Election including photographs is featured in the February 25 edition of The Catholic Leader, available in parishes this weekend.